The first location at 200 Front Street (now Martin Luther King Jr. Blvd). This is 216 Piedmont Avenue as it is today, I doubt the building is original. 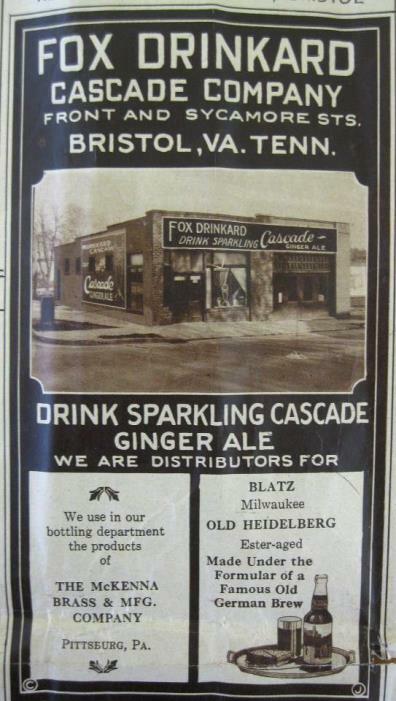 7oz Cascade Ginger Ale bottle dated 1929. Having been dug up in the Bristol area one wonders if this is a bottle from Fox Drinkard as they are known to be bottling the brand in the late 1920's into the 1930's. This cardboard sign shows what the label might have looked like.